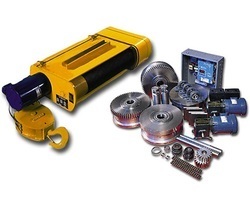 Our range of products include industrial crane spare parts. We are the leading manufacturer of Steel Mill Duty Crane Parts. Our offered assortment is manufactured by utilizing advanced technology and utmost grade raw material at our infrastructural unit. After being manufactured, the entire segment is thoroughly examined against various quality parameters. Being safe and easy to install in cranes, it is highly demanded in the market. Plot No. 309, Road No. 4A, Kathwada, G. I. D. C.